Are you looking to help relieve pain in your shoulder, neck, and back? If so, you’ll want to look at using the Laser Touch One, a helpful device that can work to stop pain instantly. I know that many times it can be a little difficult to find a product that can actually do this, and one that is affordable at the same time, but this model is an excellent product to try because of its intricate technology and unique design. Keep reading to find out more about it. If you have intense pain from aches and pains or from after a surgery, you’ll probably want to look at using a laser pain reliever. If you’re someone searching for a prescription-free way to help resolve your issues, this is an ideal product for you. However, if you’d prefer to seek something with more medical advice, then you should probably consider using something else, like a prescription. Before you buy a laser pain reliever though, there are a few things you should keep in mind. Checking to see how compact a laser pain reliever is a good idea. Some devices can be a little big which means if you want to use your laser on the go or carry it around with you, it can be impossible to do so. You’ll want to check how compact the device is before using it to ensure it can be at your disposal when necessary and won’t take up much space. It’s always important to check the price of a laser pain reliever before you buy it. Sometimes, these items can cost thousands of dollars. It’s a good idea to look closely at the price to ensure you don’t break the bank by investing in one. The price also doesn’t always indicate that it will work well for your needs. While something might be pricey, this doesn’t mean it’s the best for you. Because of this, look carefully at the various prices and make sure the device has the features you need. The other thing to consider before buying a laser pain reliever is the session times it offers. Some might only last about 10 minutes while others can go as long as one hour. Depending on your needs, you’ll want to check to see how long a session will last with the device you’re interested in. The longer time available, the more treatment you’ll be able to receive which is ideal for those who have chronic pain. 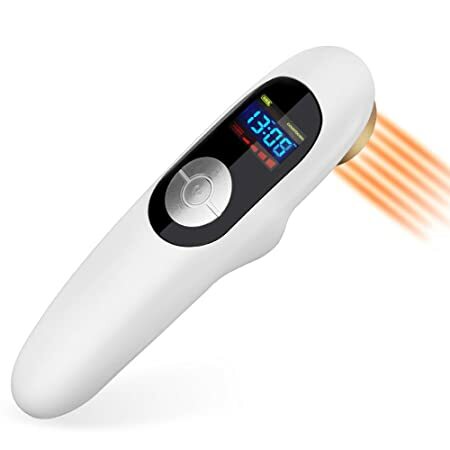 The first of its kind by Renewal Technologies, Laser Touch One works to help stop pain instantly in areas all over your body, like your shoulder and neck, thanks to its low-level laser therapy and soft vibrations. These lights encourage areas that feel painful to reduce the irritation and throbbing that are causing your body to feel bad. It comes with gel, a charger, and a carrying case you can use. The device is easy to hold. It works quickly so you get results instantly. Some treatment areas might not work as well as others. You need to use it with a special gel. While this isn’t necessarily bad, you need to keep investing in the gel in order for the laser to work. The dial on the front can be a little difficult to adjust sometimes. There are plenty of features and benefits the Laser Touch One comes with. Below are a few you’ll be able to enjoy with it. Some similar laser treatments can be very bulky and heavy. This not only makes using it a hassle sometimes but difficult because it’s hard to move around and use comfortably. The Laser Touch One though is both compact and lightweight. The laser measures about 10 x 7 x 2.5 inches so you can easily move it around and carry it. This also means you can store it away in a pocket or similar place without it taking up much space. If you’re like me, you probably want to find a product made of high-quality materials that comes with a reasonable price range. Thankfully, one of the best things about the Laser Touch One is that the Laser Touch One price is affordable and comes in a kit. The kit it comes in includes gel, a charger, and even a carrying case you can use. As mentioned above, this product comes with an electrode gel and carrying case you can use alongside your Laser Touch One. The electrode gel included comes with a fragrance and dye free formula and is designed to be hypoallergenic so even those with the most sensitive of skin can use it without fear of irritation. The gel is meant to help keep the laser lights safe on your skin and make sure it can glide around freely without problems. The carrying case included with this device is helpful to have as well. Created with a smooth vinyl fabric, it can help to protect your device from scratches and being damaged. It’s big enough to store everything you need inside it, like your laser, gel, and laser charger. It has a zipper on the top so you can easily secure the contents inside so they don’t fall out. A great feature this product has is that it comes with instructional videos. So, if you’re feeling a little hesitant to try the Laser Touch One out because you’re not quite sure how to use it, you can watch these videos. A certified professional will walk you step-by-step as to what you need to do with it depending on your needs. You’ll find videos that tell you more about this product and how to use it on your neck and shoulder so you can see instant results. Unlike some similar devices which require you to receive a prescription before using them, the Laser Touch One doesn’t. This is extremely helpful as you can get to work instantly healing your aches and pains rather than having to go through the tedious process of getting a prescription. One terrific benefit about this device is that there are no side effects. This means you won’t have to worry about it making you tired or causing irritation. You can use it without fear of major problems occurring. If you’re interested in using the Laser Touch One but not quite sure if you’re ready to buy it, you can instead opt to try its 30-day free trial feature. This risk-free trial will allow you to try everything the Laser Touch One has to offer to see if it will work well for your needs. If you find that it doesn’t, don’t worry. You can easily send it back without having to make a purchase. You’ll find that the Laser Touch One is incredibly durable which is yet another great benefit about it. It features a tough outer shell that works to help prevent it from cracking and breaking easily. Because of its durable design, it will last for a long time and work to help heal you from intense pain. Many technological devices can look and be a little tricky to use. There are often many buttons scattered around them and each need to be used a certain way in order to get results. The good news is, the Laser Touch One isn’t one of these tricky devices. 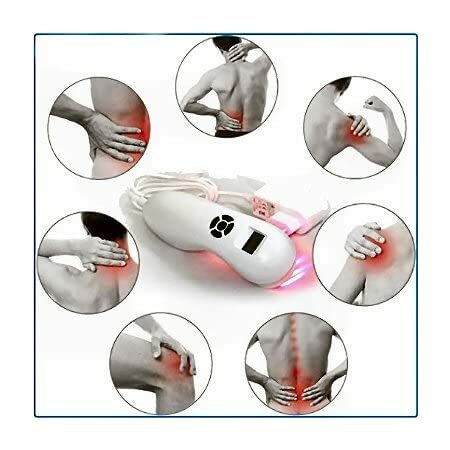 You simply charge it up, turn the power button on, and glide the laser beam over the areas you want to reduce pain in. You won’t have to worry about it being too difficult to use which could otherwise make using it a major hassle. While it’s mainly intended to help reduce pain in your shoulder, neck, and back, don’t let this stop you from using it on other places. You can glide it over your arm, stomach, legs – practically anywhere. You’ll be able to reduce pain in these sections thanks to its powerful laser that gets to work quickly healing them. If you’re still not convinced the Laser Touch One is right for you, that’s fine. There are a few other alternatives you can consider using. 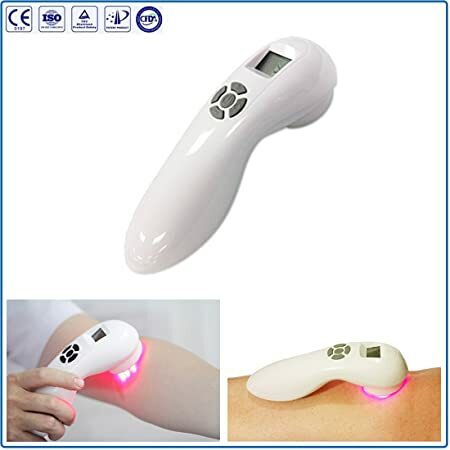 This cold laser therapy device by YJTSKY is a handheld item that you can easily slide over painful areas on your body to get relief. Made with powerful laser beams, you can adjust the intensity of them with the button on the top of it. You can also increase or decrease the pressure as well as choose various session times. It comes with a rechargeable battery as well as goggles and a carrying case you can use. + It’s less expensive compared to the Laser Touch One. +It comes with special accessories. – It’s not as compact compared to the Laser Touch One. If you’re looking for something affordable and durable, definitely consider this product. Its laser beams will get to work quickly healing you without you needing to invest a lot of money in it. The Mademax Cold Laser Therapy uses low-level laser therapy beams to help give relief to various areas of your body suffering from pain, like your neck, knees, and feet. It also works to help heal Carpal Tunnel Syndrome and other medical issues that can cause major inflammation. This compact device can be easily transported around and used thanks to its ergonomic design. A default session for this device lasts about 10 minutes unless you otherwise change it. + It can also be used safely on pets to help heal any inflammation problems they might be having. – You might need to use it for a bit before you start to see results. This affordable model is perfect for those who have severe inflammation or want a versatile product that they can also use to help their pets who have similar issues. While you’ll have to be patient for results, it’s worth the wait. The OvMax Pain Relief Laser is a helpful laser therapy device which uses both acupuncture and light therapy to help heal painful areas in your body. The strong lasers built inside work to help encourage blood circulation and metabolism which can significantly reduce pain and inflammation. This compact device can be used for various session times which range anywhere from 15 minutes to one hour. + It comes with a battery charger. + It’s easy to use thanks to its ergonomic design. – The device is a little on the pricey side. This compact and lightweight device is ideal for those looking for instant results. While a little pricey, it works to instantly heal pain and inflammation with its strong therapy lasers. You don’t have to live with intense shoulder, back, or neck anymore which can hinder your quality of life. Thanks to the Laser Touch One, you can easily reduce and diminish it with just the click of a button. It’s easy to hold and affordable which makes it ideal for those looking to get instant relief without having to do much work. If you’re interested in learning more, you can click here to check out some other information about the product.